Shabtabnews – The families of these eight Sufis have received no information about their physical condition or their location for the last 30 days. 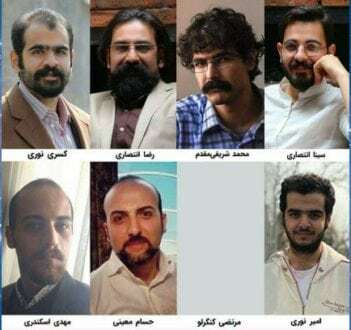 Reza Entazeri, Kasra Nouri, Mohammad Shrifmoqadam, M. Eskandari, Hassam Moeini, M Kangarooloo, Amir Noori and Sina Entazeri are the eight dervish who were attacked by prison guards in Tehran (Fshafvyh) prison and, were severely beaten, and were then transferred to to solitary confinement. According to eye witnesses several of the Sufis suffered head injuries, and broken jaws . These eight dervishes were then removed from the ward without any form medical examination. The authorities have rejected all their family’s requests for information about their conditions and whereabouts. According to report the judiciary has opened new cases against these eight and until their trial, the court will not grant them any right to visit their families.